Hey! I was just wondering if there were other Zelda fans out there? I myself am a HUUUUUUGE Zelda nerd! Zelda is definitely one of my obsessive interests. My personal favourite Zelda game of all time is Majora’s Mask! What are your favourites? Minish Cap and Phantom Hourglass. I absolutely adored Minish Cap! I am a big LoZ fan. Hyrule Warriors was a game I played so much as a love letter to fans, picking a favourite game otherwise, I think is a little difficult, because different games have different good points. Majora's Mask and Breath of the Wild would be up there, but Wind Waker and Twilight Princess do have their charm points. What about Link's Awakening on Game Boy? Nintendo just announced a remake of it on Switch today. I heard! I’m really excited for the Link’s Awakening remake! Link’s Awakening is my favourite 2D Zelda game! I love Zelda, but haven't played many of the recent ones. I prefer the portable ones, they always seemed to be a bit more risk taking and creative compared to their larger budget console versions. Link's Awakening and the Oracle games are my personal favourites. I think the most recent one I played was A Link Between Worlds, which was fun enough but wasn't particularly original. I did like how more flexible the progression was though. The Legend of Zelda was quite integral to my formative years as a gamer. I've played most of them and the few that have stood out to me have been the original, A Link to the Past, Link's Awakening, and Twilight Princess. Breath of the Wild is good but it doesn't quite feel Zelda enough if that makes sense. I liked the early games alot... the 2 NES ones, Link's Awakening, and LttP. Everything after that... ehhh. The transition to 3D just didnt work for me, neither did alot of the gameplay concepts that were introduced. Even Ocarina, I honestly just didnt care for. I did try to jump back in with Breath of the Wild recently but lost interest after about 5 hours. Felt like an Ubisoft game. Those early games though, I've played through many times. Well, not the gameboy one so much, after my original Gameboy broke long ago, way before emulators really happened. I haven't picked up a Switch yet, though probably will eventually when they make a redesign of the system. I've heard the ton of praise Breath of the Wild has received but I really can't see the appeal of it. It looks extremely bland, like it's diluted its own identity too much to follow modern trends. As for the recent remake announcement for Link's Awakening, I'm not really that interested even though I loved the original. This would be the second remake of it now? I'm not a fan of remasters/remakes in general, I'd rather play something new. I think it was more of going back to its original concepts, seeing what it could do with modern tech, and not make assumptions of what a Zelda, being stuck in thinking it has to be a long string of keys, but more on the exploration side. All the important things are there: Sword, shield and bow combat (although more depth), hearts, bombs, rupees, the races (Hylians, Zora, Gorons, Gerudo, Rito, Koroks, Sheikah and Fairies), puzzles, friends, Link and Zelda, some classic locations (Zora's Domain, Death Mountain, The Lost Forest, Castle Town and Hyrule Castle (former), and other places that feel familiar). Really it is chock full of LoZ identity if you actually go and look. There is just a big emphasis on letting the player do things their way, and that they could really go anywhere, an original concept for the even the first game. Although of course there are some boundaries in areas that may need you to improve, like more energy to climb, clothes that could give help with certain environments, better weapons, and improving you own skills. If something did feel bland, you could just go do something else. There is something like 120 shrines in the game, and they tend to feel very much in line of the series, some of the puzzles require quite a bit deductive ability or use of your tools. Zelda is my favourite game series. I find it too hard to pick my favourite. I probably had the most fun on Link to the Past and Ocarina of Time but the later games really are amazing. I have Ocarina Of Time, Twilight Princess, and Phantom Hourglass. I'd like to get Hyrule Warriors and/or Breath Of The Wild next. I'm a bit of a fan myself, though I'm not as obsessed with it as I was when I was younger. My favorite games are probably A Link to the Past and A Link Between Worlds. I also like Zelda II even though it's considered the black sheep of the franchise. 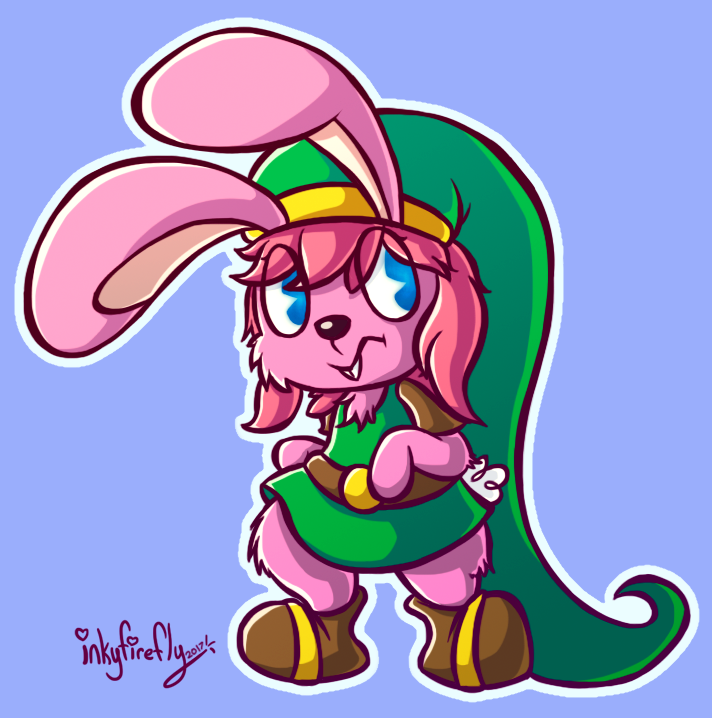 Also, I'm in love with Bunny Link from A Link to the Past. He's too damn cute! I even got an art commission of him from a friend of mine. LOVED Zelda when I was 11 but have grown out of it somewhat as I got older.